Yes, it is that time of the year again -- time to start thinking about what to get the kids for Christmas ... and it's the same thing every year -- I DON'T KNOW WHERE TO START! Stephanie - the 9 year old - she is always saying she would like this or that - but never anything SPECIFIC! She is usually pretty happy with what she gets -- but it would be nice to have an idea! Joseph - the 6 year old - who is still as obsessed with Thomas the train as he has ever been - I would love for him to get into other things - but I just don't know what! He just doesn't show interest in anything else. Samuel and Jenna - the 2 year olds - who still don't know the whole idea of Christmas. Yes, there is the whole -- Elmo, Curious George, Blue's Clues - but toys - what do you get? HELP! Give me some ideas! I am so lost .. and need to get to shopping soon! Don't even get me started on the extended family. SIL< BIL, MIL, FIL -- I always have the hardest time figuring out what to get for them -- they never give very many ideas. Jason I at least have some ideas -- won't say anything here as he reads my blog though. Again, I need help -- I need suggestions -- PLEASE!!!!! 1988 -- I was 15 years old .. and loved listening to music ... I started listening to this group called New Kids On The Block -- and was hooked! There was no turning back! The love for this group, never left! :) I was never able to see them in concert -- as they never came close to where I lived -- but I had all their tapes and had wall to wall posters (and I do mean WALL to WALL to WALL to WALL! My mom hated to go into my room and see what I had done .. but she let me do it. I would get every magazine that I could find. 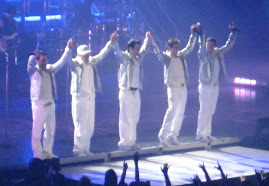 I was a Donnie Girl .. LOVED him .. had his dolls to prove it (and most of the posters on my walls proved it too) ... followed them -- even though most of my friends did not understand why I liked them so much. So, fast forward to 2008 -- and the day I found out that NKOTB were getting back TOGETHER -- and then found out they were going to TOUR! WOW .. how exciting that was!!! I got even more excited when I found out that they would be playing at the Gwinnett Arena -- which is just about 30 miles from my house!! I was on the computer the day tickets went on sale -- I was going to see them live! :) So, I bought tickets for myself and a friend of mine, her name is Heather! I got hooked on the www.nkotb.com and also www.nkotbfans.com boards. Meeting other people that would be going to the show in Duluth ... and keeping up with the shows that have already gone by -- the pictures, the videos -- I am giddy -- going back to when I was 15 years old!! Here we are now -- just 13 days before the show on October 29th!!! that she can't change the length of her calves, the width of her hips, or the nature of her parents..
how to live alone... even if she doesn't like it..
where to go... be it to her best friend's kitchen table .. .
Our trip - this might get long. Sunday, Oct 5th -- Animal Kingdom! We had never been there, so this was great. We met up with Kim and the gang and hung out with them some ... we saw the animals ... had a wonderful time. Stephanie decided that she LOVES roller coasters -- she got to go on Mt. Everest -- yikes. Not for me! LOL ... but wanted to go again after it was over! 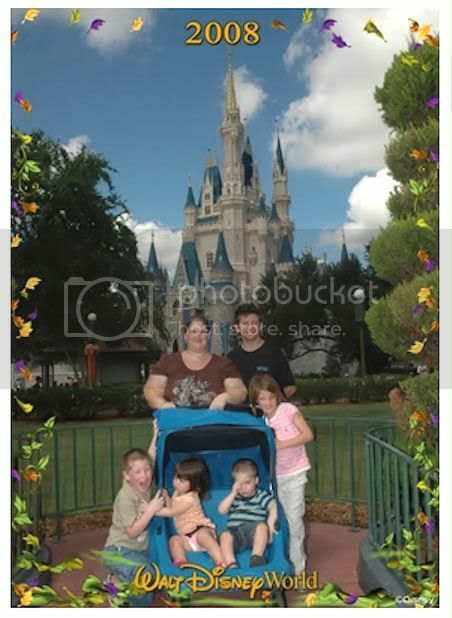 Monday, Oct 6th -- Magic Kingdom! I so love this place -- can never get enough of it! Stephanie rode Space Mountain -- yikes again -- and thought it was "tame" ... sigh! What am I going to do with that child? First snakes and now roller coasters! Jason's parents met us there in the late afternoon -- and seemed to bring the rain with them -- but that did not stop us -- we stayed on and got to see the evening light parade and the fireworks -- WOW -- so amazing!! Wednesday, Oct 8th -- we went to the Kennedy Space Center. Jason's parents met us there. It rained ..but we still had a great time. I think it was very educational for the older 2 kids .. younger 2 -- probably won't remember this trip at all. Samuel finally fell asleep while we were doing the bus tour ... he was so tired. Friday, Oct 10th -- went to Downtown Disney and had lunch with Jason's parents at the Rainforest Cafe. Awesome place!!! :) Did a little bit of shopping ... and then headed back to Linda's in the late afternoon .. needed to start getting ready to head back home the next morning. We always need a "first" blog ... and you know, I never know what to write about. Most people who are going to see this blog, know who I am -- and everything there is to know about me .. but I guess, just in case, there is some person out there who sees this -- and doesn't know. I'm Yvette -- known to some as Yvie -- I am 35 years old. Married to Jason (10 years now). SAHM to Stephanie (9), Joseph (6), Samuel and Jenna (2). We live in Georgia. Not sure what else to write, so I guess that will be it for my first post. I will try and blog some more. Most of my blogging so far has been on MySpace .. but I am following in my friend Rachael's footsteps .. and might start blogging here more!